During the Professional installation process, there is an option to install the EQuIS Library. Installing the full EQuIS Library will supply you with EarthSoft's full library of standard reports, interfaces, and forms. If you do not install the full EQuIS library, it will be necessary to import all reports, forms, and interfaces you may want to use, into EQuIS individually as is necessary with custom files. To install the full report library, select Install Entire Feature from the drop-down for the EQuIS Library. The EQuIS Library includes (but is not limited to) the following reports, interfaces, and forms. The EarthSoft Standard Reports chapter of the EQuIS Library includes a full list and detailed report documentation. The following are standard EQuIS Professional interfaces. The Interfaces help chapter includes these as well as interfaces included with higher license libraries (i.e. Data or Graphics). See Forms documentation for details. To install the full report library, after Professional is successfully installed, perform a change to the installation files by taking the following actions. 3.Right-click on the EQuIS Professional icon. 5.The installation process will rerun. 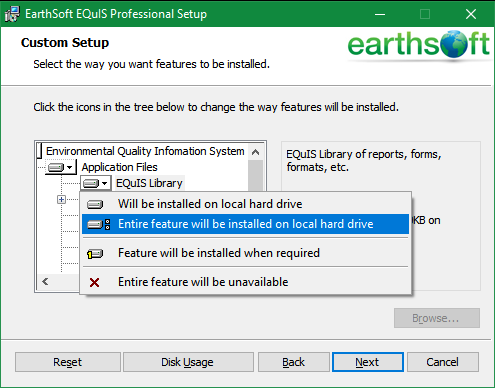 7.When the Installation Features window is prompted, select Install Entire Feature from the drop-down for the EQuIS Library. 1.Navigate to the Report list in Professional (click on Reports on the Professional ribbon). 2.Right-click on the report and select Remove From List. Set the .dll Hidden property to True as instructed below. 1.In Windows Explorer, right-click on the report.dll file. 2.Select Properties and check the Hidden attribute.